It’s been a while since I’ve posted anything on here so I thought I’d write a little update blog on what I’ve been up to and why the blog has been somewhat neglected of late. The end of January marks four years since I submitted my PhD thesis at the University of Aberdeen. In some ways it feels like just yesterday. In others, it feels like a long time ago. In the four years since I submitted, I have achieved a lot. I was awarded a fixed-term teaching contract at Durham University. I had such a fab time there. I love the north-east of England and really enjoyed working in the Hispanic Studies department there. My colleagues across the School of Modern Languages and Cultures were warm and welcoming. The students were engaged and motivated. And I got the opportunity to teach research-led sections across a variety of team-taught modules. In fact, my former colleague and PhD examiner Professor Santiago Fouz-Hernández contacted me earlier this evening to let me know that he asked his dissertation students why they had chosen to work on Spanish cinema and that they said they’d been inspired by my classes when they were in first year. Since my time in Durham, I became a mum and had a spell of maternity leave (though admittedly kept working on academic stuff during this time – work on my book, peer reviews, book reviews etc.). I worked part-time outwith academia for a while after my maternity leave before taking up a fixed-term contract as Associate Teaching Fellow in Film and Visual Culture at the University of Aberdeen. I was lucky to be asked to teach an Honours module on the topic of childhood in cinema and I had an absolute blast designing and delivering a course entitled Transnational Cinematic Childhoods. (I might well do a post on this at some point as I had a lot of interest in my syllabus on Twitter… Watch this space!!). In June 2018, my friend Dr Liz Harvey-Kattou (@lizharvey99), a lecturer in Hispanic Culture at the University of Westminster, tweeted about the publication of a special issue of Studies in Spanish and Latin American Cinemas on the topic of Central American Cinema, edited by herself and Amanda Alfaro, (a PhD student from Costa Rica). When I saw her tweet, I messaged Liz to ask about her experience of editing the journal issue. I was intrigued to know more about the whole process, not having embarked on such a project myself in my academic career to date. Liz replied with really interesting and helpful advice about the venture. We decided to have a Skype session to talk about it in more detail as I felt that Liz’s recent experience and excellent insights would make a very useful blog post for anyone interested in pursuing such a task. I have edited our conversation for clarity. Liz, firstly, thanks for agreeing to chat with me about this! Your insights will be valued, I’m sure. First off, what gave you and Amanda the idea for the special issue? Why did you think it was important there be a publication dedicated to the topic of Central American Cinema in the 21st century? No problem, I’m happy to share my experience! My PhD dealt with national identity in Central American literature and cinema and there is currently not much scholarship on this topic. In fact, Amanda and I are the only two people looking solely at Central American cinema in the UK! Though there are a number of individuals in Costa Rica studying this topic too. We became aware of an emerging interest in Central American cinema more broadly, with Guatamalan film Ixcanul winning a host of awards in 2015, a couple of Central American films appearing on Netflix for the first time and a growing awareness in the cinematic production of various Central American nations on film festival circuits. We felt well-placed to complete this project given the centrality of the framework of Central American cinema to our work, although it was not an ideal time to embark on such a venture: I had just finished my PhD and was precariously employed at that point and Amanda was in the process of undertaking her PhD. Sounds like you both invested a lot of time and effort into the process! Why did you opt for an edited special journal issue rather than another format, an edited book for example? There were two main reasons for this: 1) we wanted to get the issue out quickly and knew the book process would take a bit longer; and 2) we wanted to make use of the journal’s infrastructure in relation to peer review, for example. Studies in Spanish and Latin American Cinemas was our number one choice due to its significance for the field. That makes sense! How did you approach pitching the idea to Studies in Spanish and Latin American Cinemas? What factors influenced this choice? Was there a formula/template to follow for pitching the issue or did you have a bit of freedom as to how you did this? Our first choice was Studies in Spanish and Latin American Cinema due to its significance for the field of Hispanic visual culture. They had previously featured a special issue on Cuban cinema and it seemed like a good fit for our project. Our experience of the process was somewhat informal. We initially contacted the editors to establish whether they might be interested in receiving a proposal for a special issue on the topic. We then sent the proposed Call for Papers, which in the end formed the basis for our jointly-written introduction to the journal issue, to the editor. Her response was positive and we worked out a timeline with her. You mentioned the Call for Papers there. How did you go about soliciting articles for the issue? How did this process pan out? Were there any particular hurdles at this stage? What would you do differently, if pursuing a similar project in the future? We wrote the Call for Papers and distributed it widely. We were particularly keen for scholars based in the US and Central America to contribute. We asked for the submission of a 300-word abstract initially and were completely shocked at the number of submissions (around 24 in total)! We realised, with hindsight, that we should have made the Call for Papers more specific. We had deliberately left it as open as possible because we weren’t sure how much interest there would be! We had an array of really interesting proposals on documentary filmmaking, for example, but decided to focus on feature-length productions as that is where our interest lies. In terms of narrowing down the submissions, we thought about how the different proposed articles would fit together. We were keen to have a film from every country in Central America though that ultimately wasn’t feasible. In the end, we had an article with an overview of the field, one on distribution, film festivals and the effect of these elements on the aesthetics of filmmaking and the remainder of the articles focused on specific films from various regions. We looked for a coherent narrative across the different contributions when trying to narrow it down. There were so many interesting proposals we had to reject that just did not fit, for example one on sports figures in Central American film. But it just didn’t work well with the other contributions and so we had to reject it. That bit was tough! In addition to narrowing down the contributions, what else were you responsible for as editor? How would you describe your role as journal issue editor? How did you divide the labour between yourself and your fellow editor? One of my main tasks as editor was translating reviews into Spanish for the Spanish contributors. I also had responsibility for editing the language used in the articles while Amanda did a lot of the communications. Amanda and I have known each other for some time as we both worked with the same supervisor at UCL. We were able to work well together because of this. We both read all of the articles numerous times and were very familiar with them by the end of the process. In effect, most things were done twice by both of us! It was great working with someone else on this as I think I would have questioned myself a lot if I had embarked on such a project on my own. It was really helpful having someone to check stuff over, especially when a lot was done in Spanish. We would often meet up and read the articles together, going over them with fine tooth comb. We also wrote the introduction together. It was very much a joint venture! I’m a real fan of collaborative projects for this very reason! What about the peer review process? What was that like? Would you do anything differently if embarking on a similar project in the future? Prior to peer review, we collected in the final articles. The peer review was organised by the journal, rather than by us as editors. It was a long process and a few of the articles had to go through double peer review, in the end. What we should have done was an initial informal peer review ourselves, swapping the various articles amongst the contributors, for example. Had we done so, we would have realised that there were some incongruities in terms of style, in part due to the translation of some of the articles from Spanish into English, and in terms of the preferences of the journal’s editorial board, for aesthetic analysis over historical overviews for example. This is definitely something we learned from the process! What was the timeframe of the whole process? It took about 2 years in total. It should have actually been three months short of that. I think that’s pretty good going! I’ll say! That’s amazing. What did you most enjoy about the process? For me, the most enjoyable thing was getting the actual journal out. That was really exciting! I also enjoyed the networking, making new contacts and getting to know people’s work. We were aware of some of the contributors and their work prior to this but there were others who were new to us, particularly ECRs and people moving into the field. And what did you least enjoy? The peer review process – especially being the go-between between the contributors and the journal. You feel like you’re on the side of the contributor and it was awful having to pass on negative feedback as you don’t want to knock someone’s confidence. There was also a lot of going back and forth in some cases which involved a lot of work for us as editors. It was all worth it in the end though! Any final points of advice for anyone wishing to pursue a similar project? I guess, this sort of thing that we are doing now with the chat and blog post! Try and talk to people who have done this and can give advice – especially at a similar career stage and/or who’ve done it recently. Thanks, Liz! It has been so great to chat about this process with you and I do hope this blog is useful to anyone interested in pursuing such an editing project. Your experience and advice should certainly prove valuable! If you follow me on Twitter you’ll perhaps already know that I’ve abandoned a typical planner this year in favour of a Bullet Journal. For those unfamiliar with the concept, the Bullet Journal offers a flexible and creative means with which to plan, track and organise your life. I’ve been aware of the Bullet Journal for a while now and though the format appealed I felt somewhat intimidated by the creativity required. But when shopping for a 2018 planner I couldn’t find one that seemed fit for my needs. I am currently spinning a lot of different plates so to speak and I wanted a planner that would allow flexibility first and foremost. The Bullet Journal seemed the best option. When I originally drafted this post, I was one week into it. Somehow, 6 months have now passed! And I am a total #bujo convert! I’ve been charting my progress via Twitter: check out my feed if you want to follow what I’m doing there (I’ve been using the hashtags #bulletjournal #bujo #bujobeginner – though I’ve dropped the latter one of late as it feels a bit disingenuous now that it’s been 6 months!). I’ve found it really useful and not half as time-consuming as I expected. I mostly work with monthly and weekly planning spreads. I usually vary the monthly layout based on templates I find on Pinterest. I’ve tended not to experiment too much with my weekly planner format. If I find something I like and that’s functional, I tend not to tweak it too much. Again, I usually scan Pinterest for ideas though all that seems to achieve is me feeling envious at my lack of creativity & artistic ability! I’ve also been using the Bullet Journal to track my writing progress as I work towards the completion and submission of my book manuscript. I’ve come up with writing logs and word trackers which allow me to see how productive I’m being. Taking note of how much I can achieve in a short time as well as noting when I actually get time to write is proving enormously helpful in terms of understanding my work habits within my current routine. I am absolutely loving the Bullet Journal and plan to proceed with this for the foreseeable. It has most definitely aided my productivity and there is something very therapeutic in the process of creating new spreads. What about you? Do you #bujo? Do you have questions about bullet journalling? Drop me a line! I’m currently lying in bed catching up on Twitter and I felt moved to write on the horrific images emerging from Catalonia during and following today’s so-called illegal referendum. Barcelona first stole my heart back in 2005 when I took a weekend trip there from my temporary Spanish home in Alicante. I then lived and worked south of the Catalan capital, in the spectacular Sitges, for a year after completing my undergraduate degree. I am shocked, sickened and saddened at the displays of police brutality in the face of a population seeking to exercise nothing more than their right to a democratic vote on the matter of independence. It is just a short time ago that similarly violent images emerged from the city of Barcelona in August’s terror attacks on Las Ramblas. However, the perpetrators are not evil Islamic terrorists, posited as radical outsiders who threaten state coherence and unity, in this instance. Rather, it is the state itself behind such aggression. For Hispanists and those familiar with recent Spanish history, this violent repression recalls the all-too-recent state-sponsored suppression enacted by Francoism. To this date an unknown number of individuals, murdered at the hands of the Francoist state, lie in unmarked mass graves, their remains never afforded a proper burial, their relatives never permitted a fitting memorial or mourning process. Secrets of violent suppression under Franco remain unspoken, perpetrators have not been brought to justice more than 40 years since the death of Franco and with him Francoism. But the spectre of his legacy lives on. I cannot help but think that to respond in this unnecessarily heavy-handed (to put it mildly) manner undermines the claim that this is an illegal referendum. Two illegal wrongs do not make a right. Just the other day I was putting the finishing touches to my analysis of the silent Spanish film Blancanieves (2012). The film is a case study in the first chapter of my forthcoming monograph on the interrelations of performance and politics in contemporary Spanish cinema. Directed by Basque filmmaker Pablo Berger, the film tells the tale of Snow White but with a difference: the story has been transposed to 1920s Spain and Snow White is a kickass female bullfighter. Oh and the film is both black and white and silent. I read this formal silencing as a political gesture, one that underscores the extent to which certain voices, namely those that do not conform, suffer from a violent silencing and suppression. I made reference in my conclusion to the current events in Catalonia. Tomorrow I will rewrite this section with reference to today’s horrific developments. Memory is short. History repeats. Fascism once again rears its ugly head not just in Spain but across Europe and beyond. I fear the events of today will have caused irreperable fissures between the people of Catalonia and the Spanish state. My solidarity is with the innocent bystanders who sought only to cast their votes, to have their say in a supposedly democratic society. Barcelona, you have my heart. As I’ve already detailed elsewhere on this blog, I’ve not currently got much time available to dedicate to research. In spite of this, I do have a work schedule to uphold as I have a monograph, on performance and politics in contemporary Spanish cinema, under contract (if interested, you can read the proposal here). The monograph is based in part on one of the chapters of my PhD thesis but it radically reworks and expands that material, also incorporating new research. The manuscript is due to be submitted in April 2018. Of late I’ve been trying to spend any research time I have reading as I have a wealth of sources I’m keen to work through prior to getting down to some serious writing. That said, I’d also ideally like to keep up something of a writing habit if at all possible. Inspired by a conversation on Twitter with Dr Nathan Ryder and Dr Helen Kara last week, I thought I’d write a wee reflective blog post on the source I most recently finished reading: Performance by Diana Taylor (Durham: Duke University Press, 2016). Originally published in Spanish in 2012, Performance (2016) constitutes not just a translation but rather ‘part introduction and part reflection on some of the uses of performance that interest [the author] most – the power of performance to enable individuals and collectives to reimagine and restage the social rules, codes, and conventions that prove most oppressive and damaging’ (xiv). The original volume was, in the author’s own words, ‘a little glossy book on performance’ and won a design award (xiii). The reworked volume is also very visually appealing, a textual and visual performance in itself due to its layout. Rather than being presented in a conventional format, the book has an engaging textual interface that combines distinct fonts and font sizes alongside bold and capitalised text. There are in addition a plethora of images throughout the work. These images interact with the text in interesting ways, offering illustrative examples of the theoretical frameworks and ideas under discussion. From a disciplinary perspective, Performance presents a playful and innovative means of academic engagement with image and text. In terms of content, Taylor focuses primarily on performance in the context of performance art though she does also consider other activities under this rubric. While my book project concentrates more specifically on cinematic representations of performance, Taylor’s interventions are still of interest to the material that forms the core of my analyses. Her first chapter, ‘Framing [Performance]’, offers an analysis of how she understands and defines performance. She begins by pinpointing the role of the body in art from the 1960s onwards (1) before stressing the wide-reaching character of performance: ‘PERFORMANCE is not always about art. It’s a wide-ranging and difficult practice to define and holds many, at times conflicting, meanings and possibilities’ (6). She offers an overview of how performance has been defined by various people including artists and theorists. She suggests that performance ‘is not limited to mimetic repetition’ but also ‘includes the possibility of change, critique, and creativity within frameworks of repetition’ (15). This therefore reserves a certain potency in performance. It is a mode that challenges existing paradigms precisely through the manipulation of those same paradigms. She also charts the value of performance as ‘vital acts of transfer, transmitting social knowledge, memory, and a sense of identity through reiterated actions’ (25). She glosses Judith Butler in a discussion of the relationship between performance and gender (32) before defining performance as ‘a practice and an epistemology, a creative doing, a methodological lens, a way of transmitting memory and identity, and a way of understanding the world’ (39). At the same time, however, she acknowledges the importance of context: ‘Performances are neither universal nor transparent; their meanings change depending on the time and context and framing of their realization’ (40). This introductory chapter serves as a succinct and yet detailed overview of various definitions of performance and will be of interest to those seeking a way into thinking about performance in its diverse iterations. Chapters 2, 3 and 4 are all of notable interest for my book project. Chapter 2, ‘Performance Histories’, surveys the history of performance art. Crucial for my purposes is her assertion of a strong historical link between performance and politics: she defines performance art as ‘anti-institutional, anti-elitist, anticonsumerist’ and contends that it is in this way that performance ‘came to constitute, almost by definition, a provocation and a political act’ (49). Again of interest to my work is her third chapter, ‘Spect-Actors’ in which Taylor unpacks the significance of spectatorship in relation to performance. She charts theoretical paradigms of spectatorship in the works of Plato, Aristotle, Artaud, Rancière among others, reaching the conclusion that ‘Performances ask that spectators do something, even if that something is doing nothing’ (86). Taylor’s fourth chapter is titled ‘The New Uses of Performance’ and surveys contemporary deployments of the rhetoric of performance with a particular emphasis on the political: ‘Political advisers know that performance as STYLE (rather than ACCOMPLISHMENT) generally wins elections’ (90). Through these chapters, the author charts both the emergence of performance as concept via the history of performance art and its contemporary deployments. The middle section of Performance concentrates on the current status of performance art and performance more broadly. Chapters 5, 6 and 7 deal with distinct modes of performance. Chapter 5, ‘Performative and Performativity’, engages with the paradigm of performativity in relation to gender and the body, unpacking the role played by language with regards performance. Chapter 6 explores two key concepts, the scenario and the simulation, and analyses the ways in which performance facilitates the garnering of knowledge. Finally, Chapter 7, ‘Artivists (Artist-Activists), or, What’s to Be Done?’, provides detailed consideration of key works that subscribe to the notion that ‘Performance […] is the continuation of politics by other means’ (147). Read together, these three chapters outline the main conceptual paradigms at work in contemporary understandings of performance. The final two chapters offer a nod to what awaits both performance as mode and performance studies as a discipline. Chapter 8 considers the future of performance, but of course to invoke the future is also to invoke the past. Taylor explores the significance of the archive in relation to performance and performance art, paying particular attention to the Marina Abramović’s The Artist is Present as an instance of how both past and future are imbricated in performances. Chapter 9 continues with the notion of the future in relation to performance by surveying the discipline of performance studies. She proposes that ‘If the norm of performance is breaking norms, the norm of performance studies is to break disciplinary boundaries’ (200). After examining distinct ways in which performance is thought of within the field, she concludes that ‘What they have in common is their shared object of study: performance – in the broadest possible sense – as a process, a praxis, an episteme, a mode of transmission, an accomplishment, and a means of intervening in the world’ (202). Ultimately, Taylor contends that ‘performance constitutes a means of communication, a doing, and a doing with and to’ (208) and that ‘Performance is world-making. We need to understand it’ (208). In sum, this is an engaging and insightful volume that offers a reflective overview of the concept of performance in contemporary society. Taylor does focus on the field of performance art specifically which, for my purposes, makes the work less relevant to my book project on performance and its representations in contemporary Spanish cinema. That said, the author does also provide an original take on the theoretical paradigms governing understandings of performance both historically and nowadays. My main research project at present is the production of a monograph entitled Subversive Spanish Cinema: The Politics of Performance. The book takes inspiration from one of the chapters of my PhD thesis, but significantly reworks this material alongside new research. Inspired by a recent post by Ellie Mackin, I have decided to share the book proposal I submitted to I. B. Tauris last year to give an overview of the project and in the case that it should be useful for others currently working on a book proposal. I was offered a book contract and I am currently preparing the manuscript for submission in April 2018. Hi folks! My name is Fiona Noble and I am a researcher of Spanish cinema and visual culture. Due to personal circumstances I am not currently employed within an academic institution. I have an honorary affiliation with the School of Modern Languages and Cultures at Durham University having recently held a Teaching Fellowship there (January-December 2016). I hold a PhD in Hispanic Studies and Film and Visual Culture from the University of Aberdeen, where I also completed an MLitt in Visual Culture and an MA in French and Hispanic Studies. My research explores audiovisual articulations of identity in contemporary Spanish culture. I am currently preparing a monograph entitled Subversive Spanish Cinema: The Politics of Performance (forthcoming with I. B. Tauris) in which I examine the technical, conceptual and narrative functions of performance in contemporary Spanish cinema. My main claim is that the juncture of performance and cinema is a subversive political site. This project builds upon and extends my doctoral research in which I analysed cinematic representations of children, performers and immigrants in post-Franco Spanish cinema. I have also published on cinematic depictions of children, on intercultural lesbian relationships in contemporary Spanish cinema and on broken bodies in the work of Salvador Dalí. More broadly, I am interested in gender, sexuality, queer theory, the body, performance, the child, visual pleasure, language-learning, the economic state of affairs with regard to Spanish cinema. Beyond the world of academia, I enjoy going to the cinema (especially to see superhero films! ), football (#COYR), cats (I have two), baking and spending time with family & friends. During my week curating We the Humanities, my aim is to engage a broad audience and introduce them to, or enhance their knowledge of, the artefacts I study in my research. It is well-documented that English-language speakers often lack motivation to learn another language, let alone watch subtitled works. Spanish-language visual culture, with the exception of perhaps Pedro Almodóvar, is virtually absent from the cultural landscape in the UK and I am keen to work towards changing that fact. Due to a change in personal circumstances, I am not currently working in the academic sphere nor am I able to dedicate much, if any, time to my academic work. This is not to suggest that I’ve given up on academia. Far from it. In the last few months, I have edited and submitted the final version of a journal article following peer review (I wrote about this here), peer-reviewed three articles and I’m at present completing a book review. I have also very recently signed a book contract for my first monograph. With limited protected time for academic work, my usual working processes are no longer an option. Instead I’m having to find new ways and means of carving out valuable thinking and writing time. One of the main ways I’m doing this is through walking. I’ve always, or at least for as long as I can remember, found walking both therapeutic and productive. I’m clearly not alone in this given the recent attention paid to concepts such as walking desks, walking meetings and the like (you can read about these phenomena here and here). When I was completing my PhD, I went for a walk every day. It was sometimes only a brief 10-minute stroll around the block, sometimes slightly longer. The main purpose of this walk, which I usually took after eating lunch, was to get out in the fresh air. But I also found the act of walking coupled with time spent not consciously thinking about whatever I was working on would often lead to breakthroughs in terms of my thoughts and ideas connected to my research. The act of allowing my mind to wander unanchored in conjunction with the physical exertion demanded by walking facilitate, for me at least, the emergence of new synergies. To give a concrete example, earlier this year I was working on an article following peer review. The article contains two main strands of argumentation and one of the peer reviewers had commented that I should explicitly connect these two lines of thought and that this would reinforce my argument. Though in agreement, I could not see, in the little time I had to spend working on the edits, how I might do this. I spent a good few hours puzzling over this during some elusive #acwri time. I got nowhere. It was only when I went out for a walk, during the sleepy mid-afternoon period, that things clicked into place. I am very lucky to live in an area with beautiful walks on my doorstep. I particularly enjoy walking away from roads where possible. I’ve recently devised a route around the village that takes me along a disused railway line which backs onto fields and then into our local country park before heading along a wooded path back home. There is something very relaxing about being surrounded by nature and away from houses, cars, roads, people. My plan is to keep walking in the hope that the thoughts, ideas and inspirations continue to flow in spite of the limited time I have available to act upon them. What about you? Does walking aid your thinking? Are there any other activities you find similarly productive? I would love to hear others thoughts on this! One of my recent projects has been the production of an article on the 2014 box-office smash Ocho apellidos vascos (Figure 1). The article is to be included in a special journal issue on the film. The title of my piece is ‘”marriage itself as theater”: The Performative Politics of Marriage in Ocho apellidos vascos. My contribution focuses on the pivotal role of marriage in the film specifically in terms of its interlocking with performance and performativity. I propose that within the film marriage functions as a form of utopian unificatory politics that works at both personal and political levels. I completed the article in the summer of 2016 and have recently been asked to make some changes following peer review. As a result, I’ve rewatched and been thinking and reading about the film again. I thought I’d write a post to facilitate some of the ideas I’ve had as a consequence of the extremely thought-provoking questions raised by the reviewers. I’m aware that this a rather messy and untidy piece and what the writing of it has revealed is that I still need to spend some more time mulling over what I think about this film. In the original version of the article, my argument followed two main strands: the first concerned the performativity of the marriage ceremony and of regional identity in the film while the second linked this to what I termed utopian unificatory politics. By this I mean that the film proposes marriage as a tool for the union of the distinct autonomous regions – specifically Andalusia and the Basque Country – in Spain. One of the reviewers’ suggestions is that I link these two strands more cohesively and consider the extent to which the paradigm of performativity and the utopian unificatory politics are connected in film. My article details how marriage in Ocho apellidos vascos is a romantic ideal that, while sustained as the primary objective throughout the film, is ultimately unattainable and perhaps even unnecessary. The plot of the film, and indeed that of its sequel Ocho apellidos catalanes, hinge upon the prospective nuptials of protagonist Amaia (Figure 2). We quickly learn that Amaia has been ditched by her Basque fiancé Antxon. Reluctant to reveal the truth to her estranged father Koldo, Amaia persuades sevillano one-night-stand Rafa, whom she meets on her no-longer-required hen do, to pose as Antxon. Though the couple do reach the altar, Rafa is ultimately unable to go through with the marriage. In spite of this, the film concludes (spoiler alert!) with Amaia travelling to Seville to declare her love for Rafa. This ending thus sustains the heteronormative couple, unmarried though reunited, as the desired object. How does one negotiate this network of ideas surrounding the heteronormative couple then? The film provides an embittered critique of matrimony. Amaia is jilted not once but twice: initially (and outwith the diegetic content of the film), prior to the wedding, by the unseen Antxon and subsequently, at the church altar, by Rafa posing as Antxon. Early on in the film, we witness the protagonist attempting to return her custom-made wedding dress, willing to take a cut-price refund for the item. She later, having been dumped by Rafa, tosses it on the fire in her home, watching the dress disappear into the flickering flames. The wedding dress therefore becomes a symbol of disillusionment with the heteronormative institution of marriage. Furthermore, there are no examples of happy marriages beyond the central coupling of the film (Figure 3). There is no mention made of Rafa’s parents. Amaia’s parents are separated. She is estranged from her father and has been for six years and her mother, who does not appear in the film, is apparently in a new relationship with a man from Seville. Merche, who poses as Rafa’s mother, is widowed, her Civil Guard husband presumably a casualty of the Basque conflict. The heteronormative institution of marriage, the film appears to suggest, is, if not an unobtainable ideal, then most certainly an outmoded and redundant concept. 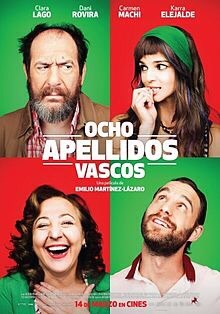 With its renunciation of marriage as the ultimate objective of the heterosexual couple, Ocho apellidos vascos conforms to the genre paradigm of the contemporary romantic comedy. While the genre is renowned for its adherence to the narrative pattern that concludes with the happy ending, specifically the union of man and woman (Mortimer 2010: 4), contemporary works have shown a tendency to replace the romantic relationship with friendship (Deleyto 2003: 182). But, like the contemporary romcom, while the film might dismiss marriage as an antiquated idealism, it retains the heteronormative couple as the ultimate objective for its protagonists who are reunited in the concluding sequence, as mentioned above. In this regard then, Ocho apellidos vascos offers no escape from the heteronormative structures and structures that dominate society, politics and culture. Without wanting to produce a dichotomous or reductive reading, should we interpret this position on marriage positively or negatively? How are we to understand the depiction of the unmarried couple and its function within familial relationships? How might the personal politics, epitomised by the unmarried couple, at the core of this film map onto national politics? In my original article, I was quite sceptical about the underlying politics of Ocho apellidos vascos. My initial reaction was that the film is proposing the utopian unification of the nation, in which similarities rather than differences are emphasised, by means of a romantic relationship, if not marriage, between two individuals from distinct autonomous regions within Spain. However, having rewatched and thought some more about the film, I’m starting to wonder if the film is amenable to a more nuanced, and perhaps more generous, reading of kinships and affective relations (Figure 4). The traditional nuclear family, which typically revolves around the mother and father (or, in other words, the heteronormative married couple), is absent in Ocho apellidos vascos. In its place are a series of affiliations forged through choice: Rafa and his friends, who appear to be a substitute for his family; Rafa and his “mother” Merche; even Merche and Amaia’s father Koldo, who will become romantically involved by the end of the film (and whose love will be rekindled in the sequel Ocho apellidos catalanes). With this in mind, to map the politics of the personal onto the national in Ocho apellidos vascos necessitates a nuanced interpretation of the relationship between the family and the nation. What I’m starting to realise, especially in the writing of this post, is that this relationship, and the associated political stance of the film, is more complex than I initially thought. This is not to suggest, of course, that the film is without issues or flaws but rather that I need to unpack in more detail the undercurrents of personal and national politics at its core.